I'm arriving JFK by Etihad Airways at 16:30pm on 28/9/2012 and have a connected flight to MCO on Jetblue at 17:55. 1)Is that an enough time in between to catch the connected flight? and how long does it need? 2)which terminals are the Etihad & jetblue & the Delta? 1.Yes you have enough time. 2. 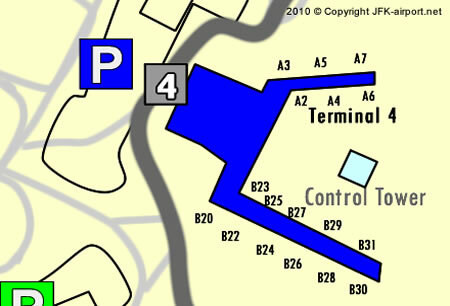 Ethihad is terminal 4 Jetblue is terminal 5 and Delta is 2,3,4. Will we have enough time to make the connecting flight since we have to clear customs and I believe change terminals from terminal 4 to terminal 3? get through immigration quickly and catch the flight to Jax from terminal 5 . Do you they will have enough time. No there is no express line for immigration. Yes I think they have enough time. my daughter is handicapped and needs to use the bathroom shortly after arriving at JFK, terminal 4, next friday. Can you tell me if there's toilet before submitting to the officers of the Customs? There is on shortly before Customs. hey I'll be flying on 5th sep via qatar airways from Doha which will land by 15:00 at JFK and then i got to take JetBlue at 18:15 to sfo .Since terminal 4 deals with qatar airways I need to know if I have enough time to check in terminal 6 of jet blue with all my luggage and after security check. Yes you do and Qatar airways is terminal 8 now.